It has been discreetly pointed out to me that that I was wrong in a post earlier today about Justice Robert A. Blair, the new Chair of the Copyright Board, having participated in the 1989 case called R. v. Miles of Music Ltd., 1989 CanLII 255 (ON CA) from the Ontario Court of Appeal. In fact, Justice Robert A. Blair was not appointed to Court of Appeal for Ontario until November 5, 2003. The Judge, Blair, J.A., who wrote the opinion that I had quoted was in fact Justice Duncan Gordon Blair, who sat on the Ontario Court of Appeal from 1979-1994. The case report does not include Justice Blair's initials. Even the Ontario Court of Appeal website is confused - it apparently misspells his middle name as "Godren". I will update my blog from earlier today shortly and, meanwhile, offer a rare but in this case well-required “mea culpa”. It is totally inappropriate – indeed blatantly disgraceful – for Music Canada to urge an “astroturf” letter writing campaign to the new Chair of the Copyright Board regarding the Board’s Tariff 8 decision, or indeed any other issue. 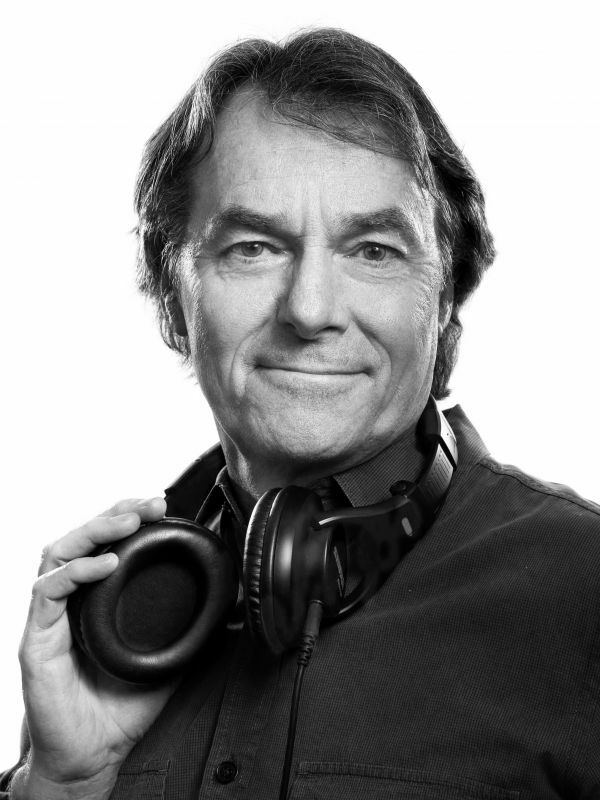 Send an email to newly-appointed Copyright Board chair Justice Robert A. Blair, urging him to facilitate the prosperity of Canadian cultural businesses rather than impede it by recognizing the value of the Canadian music industry for all Canadians. Congratulations on your recent appointment as the chair of the Copyright Board of Canada. Under the previous leadership of the Copyright Board one year ago the Tariff 8 decision to provide creators with rates 90% lower than those they had negotiated commercially. This decision discards years of agreements freely negotiated between digital music service providers and the music industry and sends a message to the world that it does not value music as a profession. This is inconsistent with Canadian values. These rates were unprecedented globally – they are one of the world’s worst royalty rates for non-interactive and semi-interactive music streaming. One year later Tariff 8 decision remains a serious setback for the music community in Canada, for artists and the music companies who invest in their careers. This decision has created a regulatory precedent that ignores the reality of the marketplace and will continue to harm the business climate in this country and create a market uncertainty. Today Canadian recorded music digital revenues and physical revenues combined only represent half of revenues fifteen years ago. I urge you in your new position to make decisions that recognize the value of the Canadian music industry for all Canadians, and to create tariffs that pay creators fairly. Canadian creators should not be paid less than their contemporaries around the world. As you begin your mandate please consider how the Copyright Board can facilitate the prosperity of Canadian cultural businesses rather than impede it. The Copyright Board is an independent quasi-judicial tribunal. Parties make their case. If they don’t like the result, they can seek judicial review. It is NEVER acceptable to “lobby” such a tribunal in any way, and especially reprehensible to write lobbying letters to its Chair. This is an insult to the Board and its distinguished new Chair, Justice Robert A. Blair. · Sony Music Entertainment Canada Inc.
· Universal Music Canada Inc.
· Warner Music Canada Co.
Music Canada and those who oversee it should be completely ashamed. This campaign should, and no doubt will, backfire badly. This may be a high point in hubris for Music Canada, following its windfall lobbying success for sound recording and performers' copyright term extension. But this is a low point in so-called “advocacy” in Canada. As expected, Access Copyright (“AC”) is seeking judicial review (“JR” or "appeal" in lay person's terms) of the Copyright Board's devastating decision of May 22, 2015 re its proposed Provincial Government tariff. Here’s the JR Notice of Application. The Canadian Copyright Board – Can We Move On With Substance and Process, or Do We Need Still More Statistics? There are signs that things are changing at the Canadian Copyright Board. We have recently seen a landmark decision involving Access Copyright’s proposed Provincial Government tariff that is nothing short of a “devastating defeat” for the collective and will not yield enough revenue to begin to pay for the cost of obtaining the tariff. This is the second time in a year that a major collective has apparently failed to recover enough in tariff revenue even to pay its likely legal and expert costs. The other involves Re:Sound’s Tariff 8, which I've written about, and which the music industry continues to complain about. (Some aspects of the irony of how this case plays out inside the music industry are dealt with by Michael Geist here). It would frankly be surprising if judicial review will make a big difference in either case. Inaugural tariffs are, it seems, no longer bankable assets that can justify spending several million dollars on lawyers and “experts” on the nearly guaranteed expectation of generating several tens of millions in return in a few short years mostly at the expense of the general public, as the CPCC and others once counted upon. Moreover, the economics of defending tariffs are changing, with the new phenomenon of major objector associations withdrawing their objections and leaving their membership in the lurch of what is now effectively a default proceeding mid-way through Access Copyright’s Post-Secondary tariff application. Why this happened is another matter that has not been publicly explained. In the absence of any other plausible explanation, one can only suspect that this is because the objectors’ funding well had run dry. 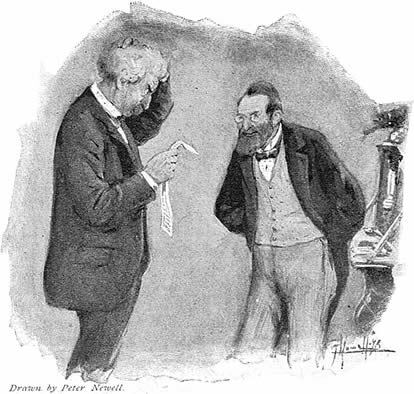 Questions might be asked about whether that withdrawal was inevitable, along with why the interrogatories were answered by so many members at clearly enormous cost to the educators and benefit to Access Copyright, when even the Board would have been happy with a “…a reasonable amount of relevant information, from a reasonable number of institutions….”. But the result is obviously what it is – which is a serious problem for the Board and for Canadian copyright policy, not to mention for Access Copyright and the Canadian educational community. More about this to follow soon. Potentially even far more importantly in the long term than these recent events, we have just seen the recent appointment by the Government of Justice Robert A. Blair of the Ontario Court of Appeal as Chair of the Copyright Board. He has had important involvement in high profile IP cases and systemic institutional justice reform in the Ontario system. Hopefully, his appointment augurs extremely well for some much needed change at the Copyright Board. He was the Co-Chair of the pioneering Civil Justice Review initiative in Ontario in the 1990s and has long been recognized as one of the lead architects of reform in that province’s court system. That reform was also influential in other provinces and at the Federal level. The Copyright Board is surely a much smaller ship to turn if course correction is needed, as many from all viewpoints now believe to be the case. These developments are very promising and set the stage for the implementation of much needed regulations to ensure that the Board gets back and stays on course with the original vision from Judge Parker in 1935. However, there are some who are apparently reluctant to conclude that there are serious problems at the Board that need to be addressed. Even the “working committee” process set up a long time ago by the Board and its belated and disappointing report has led to a remarkable consensus among a strange group of bedfellows that this report would only likely make things even worse in terms of delay and expense. It’s commendable that the Government – through both Industry Canada and Canadian Heritage – has co-operatively sponsored a study from such a well-known author/researcher as Prof. de Beer. We have seen only a few outside studies on copyright law and/or economics by well qualified experts since the long hiatus after the golden age of the early 1980’s. For example there are these from Industry Canada. The Canadian Heritage website appears to be significantly out of date. It does not refer to any events since 2010 and doesn’t seem to include any longer any of the studies it has sponsored on its own in recent times, such as this one that I commented on in 2007. Therefore, any well done study would be welcome – and more cooperation between these historically rivalrous departments is potentially a very welcome sign. That said, the institutionalized rivalry is there for a reason – and the joint role of both departments mirrors the inherent dichotomy of the copyright debate overall. Both departments should continue to have a role and keep an eye out on each other. Prof. de Beer has undertaken what is essentially a statistical analysis of key milestones in the timelines of cases at the Copyright Board over a 15 year period. For the reasons below, and with the utmost respect, I must, however, seriously question whether such a statistical analysis was necessary or even useful, and, indeed in any event, whether the methodology was appropriate. I remain quite baffled by the above numbers, which are surprising, counter-intuitive and arguably counterfactual. The Board itself makes no claim to this magnitude or annual rate of “tariff” activity. Indeed, as shown below, Prof. de Beer’s numbers of 852 certified tariffs overall for the 15 years in question at the rate of 70 per year are, in comparison to the Board’s taxonomy as seen on its own website information, apparently approximately 1,150% and 1,400% more respectively than the Board itself claims. The figure of 209 pending tariffs is equally and incredibly astonishing. I had a brief posting on this almost immediately after Prof. de Beer’s report was released but I took it down because I thought his report deserved a more detailed and reflective analysis, which follows. Some will use this study to suggest that the Board is very productive, since it supposedly certifies 70 tariffs a year according to Prof. de Beer. However, as I show below, even the Board’s own numbers suggest a much more modest rate of 4.9 “tariffs” a year, using what both I and the Board would consider a more realistic notion of what “tariff” means. And those who keep close watch are likely to feel, on an “anecdotal” basis, that even that number seems high. For example, we are now almost half way through 2015 and the Board has rendered only two significant substantive decisions and has certified only two tariffs by any normal measure, both of which have roots going back a total of about 14 years and one of which was a redetermination ordered by the Federal Court of Appeal. I have discussed both of them recently, namely here and here. When dealing with such low numbers, “anecdotal” observations may be more important than any so-called statistical analysis, which may not even be possible with such little actual data, if the meaning of “tariff” is realistically interpreted. Others may see these high numbers and the methodology used to generate them as lowering the average delay time and tending to hide the unexplained and inexplicable fact that too many tariffs take at least four years to get to a hearing and at least two or more years thereafter for a decision to be rendered, and that the quality of the decisions is such that they are often reversed, if not corrected quickly by the Board itself in two recent instances. Even allowing for the possible diluting effect of Prof. de Beer’s methodology, the fact that it takes an average of 3.2 and 4.42 years to certify a tariff without and with a hearing respectively is still cause for considerable concern. The statistics generated by Prof. de Beer will no doubt be used by those who perennially argue that the Board needs more resources. However, without any identification of the causes of the delays at the Board and without any “normative” analysis and judgments, there is no basis whatsoever to support such a suggestion. Indeed, given readily available comparisons to other tribunals close by, most notably the Competition Tribunal, it is at least as plausible in principle that the Board already has too much in the way of resources and this may be part of its problem. These real questions need, at least, to be explored. Prof. de Beer explicitly stops short of any normative judgments or analysis of why things take so long and repeatedly suggests that more even more data and studies are needed. However, in my view, the last thing we need is more studies to prove that things take too long. Even retired Board Chairman Justice William Vancise, who promised about a decade ago to shorten the pendency time from hearing to decision to six months (see below), would likely not dispute that things have gone from bad to worse. We don’t need expensive statistical studies to prove what is obvious and incontestable. What we need to do is figure out why things take so long and how to fix the problem. Accordingly, this study’s approach was to disaggregate data from every “tariff” proposal based on the multiple procedural possibilities between publication and certification. During the research proposal, every certified tariff was broken into its constituent components and subcomponents, dissected by year, number, and letter (where relevant). For example, the Board’s decision on Re:Sound’s Tariff 6.B (Use of Recorded Music to Accompany Physical Activities) for 2008-2012 dated July 6, 2012 became five units of analysis; Re:Sound 6.B 2008, Re:Sound 6.B 2009, Re:Sound 6.B 2010, Re:Sound 6.B 2011, and Re:Sound 6.B 2012. The disaggregated data was then correlated backwards to the collective society’s original proposal that had initiated the tariff-setting process. One consequence of this approach may be to complicate the statistical analysis by raising independence issues in the data. Although each tariff will be unique in at least one respect, some units of analysis may involve identical data-points, such as a common proposal or certification date. Nonetheless, this approach was clearly the best, if not the only, feasible option for analysis. Thus, Prof. de Beer’s methodology is arguably questionable because it appears to equate the numerous unimportant, simple and unopposed tariffs proceedings that should occupy little or no Board time with those that seem to never end. That, very likely, will lower the average overall delay times by a significant amount. Indeed, I suspect that if the Board’s own classification of what is a “tariff” and a “decision” were to be used, as shown below, which more accurately corresponds to the way the Board actually works, the result would be that there is simply not enough statistical data to warrant the detailed type of statistical treatment that Prof. de Beer and his team have undertaken. 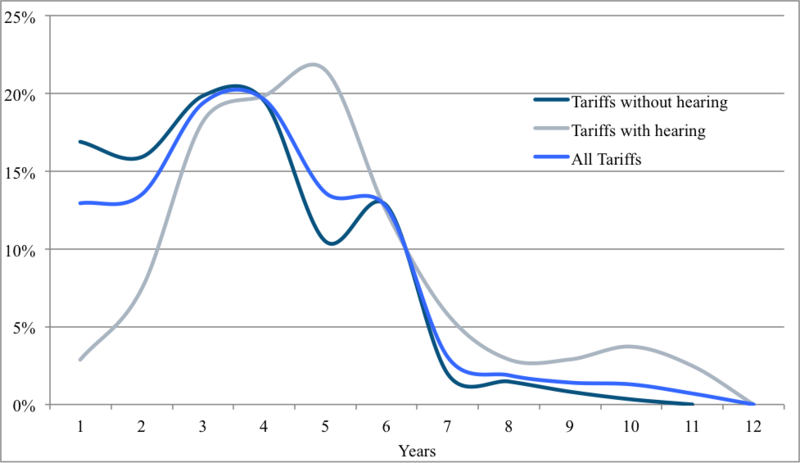 Distribution of certified tariffs applicable for the years 1999-2013. According to my data, 852 different tariffs were certified by the Copyright Board in respect of the 15-year period between and including 1999-2013. There are 209 pending tariffs that were proposed for that period but have not yet been certified. The certified tariffs took an average of 3.5 years to certify after filing. The average pending tariff has been outstanding for 5.3 years since filing as of March 31, 2015. On average, tariffs are certified 2.2 years after the beginning of the year in which they become applicable, which is in effect a period of retroactivity. The standard deviation in the time from proposal filing to tariff certification is 2 years. A hearing was held in 28% of tariff proceedings. The average time from proposal filing to a hearing in those proceedings was just over 3 years. The average time from a hearing to tariff certification was almost 1.3 years. The hundreds (according to Prof. de Beer’s methodology) of minor, unopposed and economically insignificant separate tariffs that Prof. de Beer’s methodology apparently identified and measured are not the main problem at the Board, although they are still a big problem because there is no apparent reason why there is any significant delay whatsoever in certifying them. The real problem is the contested and often very important tariffs that result in hearings – and, more recently, default proceedings in the case of the Post-Secondary file that is apparently stalled indefinitely and presents very serious challenges to the Board and to the public interest. Even according to Prof. de Beer’s numbers, about 20% of Board cases that involve hearings take at least 6 years to be certified. And these are not “outlier” cases. Those who follow the Board know that these are probably among the more visible and important hearings that the Board deals with, such as the most recent tariff. This was the “fitness” tariff, which I have discussed elsewhere in some detail and briefly below, that has taken almost 8 years to reach what may still be an inconclusive resolution. It would have been very helpful and presumably not too difficult to provide links to the actual tariffs and decisions that took more than six years to certify. Indeed, links to all of the tariffs, using the Board’s taxonomy, would have been helpful and not difficult to provide – see below. Another problem with the study’s methodology is that it does not deal with the fact that many tariffs are certified in huge batches periodically, of which some elements attract little or no attention and some do attract varying degrees of opposition. Here’s a decision from 2004 that covers SOCAN tariffs on everything from marching bands to magic shows, from restaurants to planes and trains, not to mention adult entertainment clubs to fireworks displays. Some elements were opposed. Others not. The process was spread over several years, with some of the tariffs being filed as early as October 18, 1997 and others up to April 19, 2003 and with hearings held in 2002 and 2003 on various aspects. The Board’s decision on the whole batch was not released until June 18, 2004. It’s far from clear how Prof. de Beer’s methodology could “disaggregate” this eclectic smorgasbord of a decision in any meaningful way. This raises the question of why the Board cannot simply quickly approve an unopposed tariff, especially one that may have previously been considered, and why these things are allowed to accumulate and linger and grow old together. Some elements of this decision were economically trivial. SOCAN’s Tariff 10.B for “marching bands” actually generated $4,984 in the year 2000. In that year, its tariff 13.C for trains and buses generated $378. On the other hand the tariff for Cabarets, Cafes, Clubs, etc. – Live Music) generated $2,145,057 that year. The Board used to provide these kinds of numbers, but it seems that it does not see the need to necessarily do so anymore – for example in the fitness tariff discussed below, where such numbers would be expected, if not essential, given the public interest aspect of that tariff and it importance to so many people. Moreover, we see tariff files that never seem to end. These include SOCAN’s Tariff 22 internet tariff, which has been going on in one way or another since 1994, with the current iteration concerning the alleged “making available” right and SOCAN’s never-ending quest concerning its Tariff 22.A. The current iteration of proposed SOCAN Tariff 22.SA which was filed as a proposed tariff in 2012, is still in a preliminary phase. This preliminary phase was not supposed to include any evidence but now has extensive evidence from experts around the world, which seems strange since the Supreme Court of Canada and the 2012 Copyright Modernization Act would appear to be quite clear on the issues at hand, This issue – or more likely in the end a non-issue – could have already been to the Federal Court of Appeal if not the Supreme Court of Canada had it been handled more decisively by the Board and some of the main parties, who seem in no hurry for this file to come to an end. The Access Copyright Post-Secondary Tariff has been in a state of suspended animation since the Board ruled on January 17, 2014 that “For these reasons, and because of the additional drain on Board's resources this implies, the Board postpones sine die the hearing in this matter. After having received and analysed all answers from Access, and replies from Mr. Maguire, the Board will either decide when to reschedule the hearing or proceed on paper.” This was a tariff that was filed in 2010 and is now, for various complicated reasons, unopposed. The Board has still not indicated how it will proceed on this matter. This is a minor tariff that has occupied little Board time. Opposition to this tariff has essentially evaporated, since it now only applies to the obsolete medium of blank CDs. The Board lists each year from 2012 to 2016 as separate tariffs, but there were only two proceedings for that period. This is by far the major sector covered by the Board. There are 47 tariffs listed, but 8 of them involved both SOCAN and Re:Sound (formerly NRCC), so they should not be counted separately. There are 41 decisions between 1999 and 2013, some of which concern relatively minor matters. There are 4 decisions, only one of which has resulted in an actual tariff. The Board has rendered 14 decisions between 1999 and 2014 – all but one of which (now pending in the SCC in CBC v SODRAC) were “interim”. These are not part of Prof. de Beer's analysis but are included in this chart for the sake of completeness to show the Board’s level of activity. These are not “tariffs” and even the term “arbitration” is a misnomer. Even this is an inflated number, and reflects a number of minor “redeterminations” and other less than significant events. But is still the Board’s own number, as calculated from the Board’s own posted information. Still, this is less than 10% of Prof. de Beer’s number of 852. This the total of 74 certified tariffs divided by the number of years being studied (15). This is greater than the number of decisions per year, since many of these tariffs are unopposed because they are unimportant or the objectors cannot afford to participate in the Board’s process, or for other reasons – such as the oppressive and intrusive interrogatory process. I make no reference to the “unlocatable” decisions, also studied at great length by Prof. de Beer and the Board’s former general counsel, Mario Bouchard. I have commented at some length about that study and those decisions. I agree with Prof. de Beer, though perhaps for different reasons, that this corpus of about 283 issued licenses and 8 denied licenses to date need not be considered as a factor in the Board’s overall productivity or performance. So, if the Board is right, and I am right, then Prof. de Beer’s conclusion that the Board has certified 852 tariffs in the last 15 years is off by a factor of 852 ÷ 74, i.e. ~1,150%. His conclusions that the Board certifies 70 tariffs a year would likewise be off by a factor of 70 ÷ 4.9, i.e. more than 1,400%. The K-12 hearing had about a two year delay in rendering the decision, which was then reversed by the Supreme Court of Canada. It has been 2.5 years since the Board’s hearing in the Access Copyright - Provincial and Territorial Governments Tariffs (2005-2009 and 2010-2014). Now, in the last week or so, we finally have a decision, which I have discussed in detail, that will no doubt be “appealed” (judicially reviewed, as lawyers say). The “fitness” tariff discussed below took more than two years to decide initially, and more than a year to redetermine, after submission of a settlement agreement. It took about 8 years to inconclusively resolve. SODRAC Tariff 5 (Reproduction of Musical Works in Cinematographic Works for Private Use or for Theatrical Exhibition), 2009-2012 had approximately a 2.5 year delay from hearing to decision and is now pending before the Supreme Court of Canada. · First, we don’t know what he means by a “hearing” or a “decision”. Some of the Board’s hearings and decisions are quite perfunctory. His conclusion that “hearings last on the average 22 days” (page 37) is highly questionable. To be fair, he does indicate that this figure is unreliable because some hearings may be spread over a prolonged period. But, if actual hearing days are counted, there are very few hearings indeed that have lasted that long. One of the key findings of the study is easy to miss – because it concerns the 209 “pending tariffs” – i.e. proposed but not yet certified. That average time outstanding, as of March 31, 2015, was a disconcerting 5.31 years. Note the highlighted lengthy delays while the Board contemplated its decisions. The last delay of over a year is particularly ironic, since the parties had submitted a consent agreement in February of 2014. How long should it take to approve a consent agreement submitted by sophisticated parties after a seven year struggle? I have commented on this on this case in much more detail here. As I have earlier pointed out, the Canadian Judicial Council has recently stated that “judges should render decisions within six months of hearing a case, except in very complex matters or where there are special circumstances.” It is difficult to find, if not impossible, to find any examples of cases at the Board that would warrant an exception to this benchmark. now settling into its role and the process is becoming faster, or whether the complexity continues to grow and the tariff-setting process is in fact taking longer than it was several years ago. Only more time, and more data, will tell. It does not require any sophisticated study to illustrate that the Board is taking much longer to issue comparatively far fewer decisions than other comparable institutions at the Federal level. What we need now is to look at how other comparable tribunals in Ottawa operate with the benefit of established regulations and how such regulations might be adapted to work in the Copyright Board context. If we focus on a realistic notion of what a “tariff” is, which is what the Board certifies in the Canada Gazette a few times each year at the most, we can get back to common sense and then perhaps move forward. We need to focus above all on the factors that have resulted in what virtually everyone considers to be the unacceptable timelines and delays prevalent at the Board. These delays depart far from other judicial and tribunal norms but now seem to be the new normal at the Board. It may prove to be the case that human, institutional and political factors, which are not measurable by Prof. de Beer’s or any other statistical methodology no matter how scientific and reliable, need to be addressed. Judge Parker’s remarkable report about collective activity in Canada that led to the creation of the predecessor of today’s Copyright Board, which worked a lot better in may respects for more than 50 years than does the current Board, has just had its 80th anniversary. We don’t need more dithering and distraction. Even the “working group” process set up a long time ago by the Board has led to a remarkable consensus among a strange group of bedfellows that thelong-overdue report will likely make things even worse in terms of delay andexpense. We now have, after a hiatus of more than a year, a new Chair of the Copyright Board who is remarkably well qualified for the challenges that must be dealt with. With his notable experience in reforming the Ontario judicial system, Justice Blair is eminently qualified to initiate regulations, which would require approval by the Governor in Council, governing such matters as “the practice and procedure in respect of the Board’s hearings…” pursuant to s. 66.6(1). Hopefully, now, the Government can also undertake a consultation to ultimately ensure that other necessary and inevitable regulations are implemented pursuant to s. 66.91 to deal with “policy directions” and what constitutes “fair and equitable royalties” and “rendering its decisions”. Other comparable tribunals at the federal level have such regulations in place. There is no reason that the Copyright Board should be without such guidance, especially when the authority for these regulations has long been in place. So, a couple of decisions in the last year show some hope of some change from within the Board in terms of its substantive dealing with evidence and law. However, there are still some very fundamental issues that can only be addressed in the long term through regulation and/or statutory change. Hopefully, the regulatory process - which is available now and does not require the involvement of Parliament - will suffice. The Government has used regulation before guide the Board. One example was the Retransmission Royalties Criteria regulation, which was too vague to be clearly effective. Another was in relation to private copying levies, an issue with which I was long involved. The result was a highly specific and totally effective regulation to ensure that “microSDs” would be excluded from the definition of "audio recording medium" and thus be beyond the Board’s reach. Hopefully, now, we can look for progress in Ottawa both at 56 Sparks Street and around the corner at the Langevin Block. The appointment of Justice Blair as Chair, with his background that is perfectly suited for the task of institutional reform, seems to indicate that the Government recognizes that change is needed now. One thing, at least, is quite clear. What we do not need now is more statistical analysis.